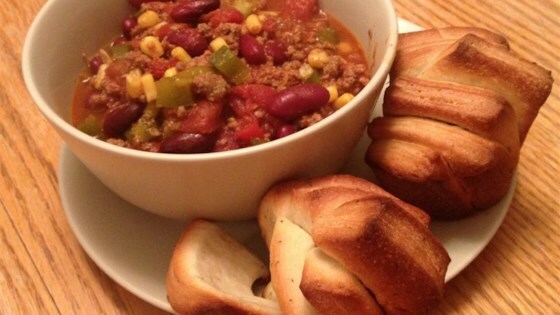 "This is a great chili recipe that can be made in a slow cooker for those busy days! I serve mine with sour cream, shredded cheese and onions. Enjoy!" Heat a large skillet over medium-high heat. Cook and stir beef in the hot skillet until browned and crumbly, 5 to 7 minutes; drain and discard grease. Transfer beef to slow cooker. Stir kidney beans, diced tomatoes, stewed tomatoes, green bell pepper, green chile peppers, chili powder, garlic, sea salt, and black pepper into the ground beef. Cook on Low 5 1/2 to 7 1/2 hours. Stir corn into the chili and continue cooking 30 minutes more. Make this spicy, thick chili in a snap. Loved it!! Did yard work all day and this was great to end it with!! I will definitely make this again. This was very easy and tasty. I didn't have 2 cans of Rotel, so I just used stewed tomatoes for one of the cans and it was still plenty spicy for our taste.